First time visitors to Chandni Chowk will be bombarded with every sight and sound you'd expect from one of India's oldest markets. While India is known for its numerous market places, Chandni Chowk champions them all. Dating back to the 17th century, Chandni was originally a small half-moon shaped space that sat beside a canal 'reflecting the moonlight', which lead to its name - chandni meaning ‘moon’ and chowk which literally translates to a ‘market at a junction.’ Over the years the area kept extending and now it houses thousands of shops spanning 1.5km, with Fatehpur Mosque on the western end and Red Fort on the other. To the unfamiliar eye, it may look like a complicated maze, but there is great order in the commotion. 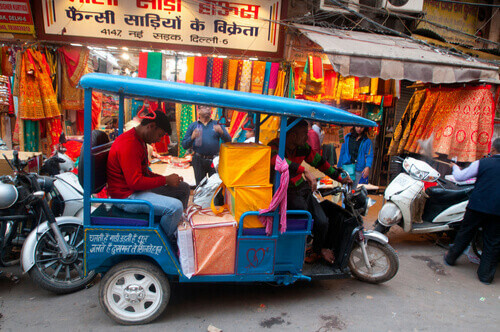 Each area within Chandni Chowk is divided into areas or zones depending on what type of goods are sold. The narrow streets commonly referred to as gallis in Hindi, have their own name so it’s easy to navigate your way and ask for directions if you know where you want to go. For those who have no particular agenda, just make your way from one street to another enjoying the element of surprise that will greet you at every bend. Katra Neel is literally the ‘material world’ of Chandni Chowk. Readymade Indian outfits from plain to the more flamboyant embroidered fabrics are offered. Formal suits and shirts and trousers for men are popular purchases. If you’re in the market for home furnishings like drapes and other upholsteries, this is the place to come - just ensure you have the luggage space. Dariba Kalan is known as the silver portion of the market where you can find anything from small trinkets to more elaborate silver pieces and accessories. Once you’ve stocked up on jewellery, get a sweet fix at nearby Old Famous Jalebi Wala. Operating since 1884, this much-loved sweet shop is best known for jalebi, a deep fried, sugary orange pretzel-like treat which is served straight from a pot of sizzling oil. You’ll smell Paranthe Walli Galli before reaching this enticing food street. 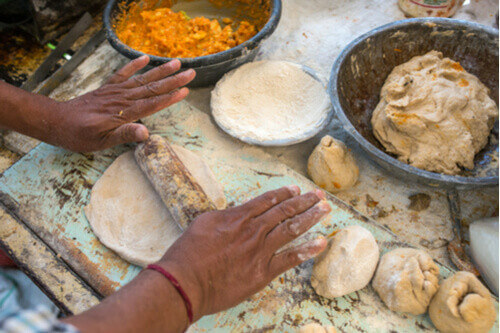 Paratha or Indian flat bread can be found here in all its incarnations - from fried to roasted with a variety of stuffings and accompaniments. Our pick is Jung Bahadur Kachori Wala, who sells fried stuffed balls of dough with chickpeas, especially good if you enjoy a dose of spice. 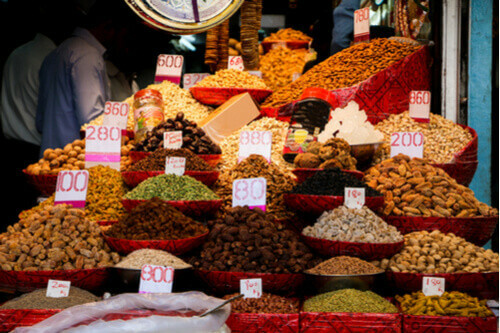 Khari Baoli is where you’ll find the world’s largest wholesale spice market. Nuts, seeds, herbs and staples like tea and rice are also found here, but most come to peruse the hundreds of spice stalls. Camera Galli, as the name indicates is the tech area of the market, including a large selection of camera stalls. It poses as a striking difference from the shiny stylish gadget stores found in malls today, but you still enjoy the age-old character of this area. 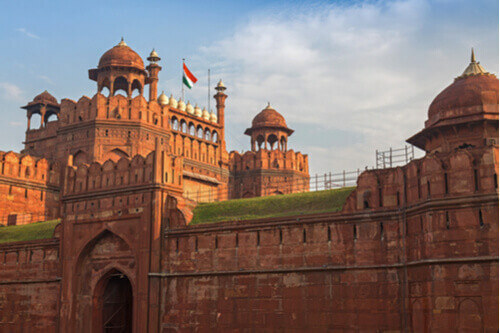 Before exploring Chandni Chowk ensure you wear loose, comfortable clothing, wear footwear that you can slip on and off with ease (a number of stores require you to remove your shoes before entering). 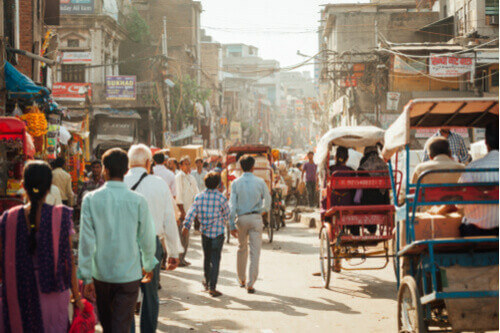 Just as you would in any bustling marketplace in the world, keep your bags and wallets safe and with you at all times (approximately 200,000 people a day visit Chandni Chowk). Vibrant, energetic and exuberant, it is difficult to describe just how incredible and sometimes overwhelming a visit to Chandni Chowk can be, but definitely one to tick off your bucket list.